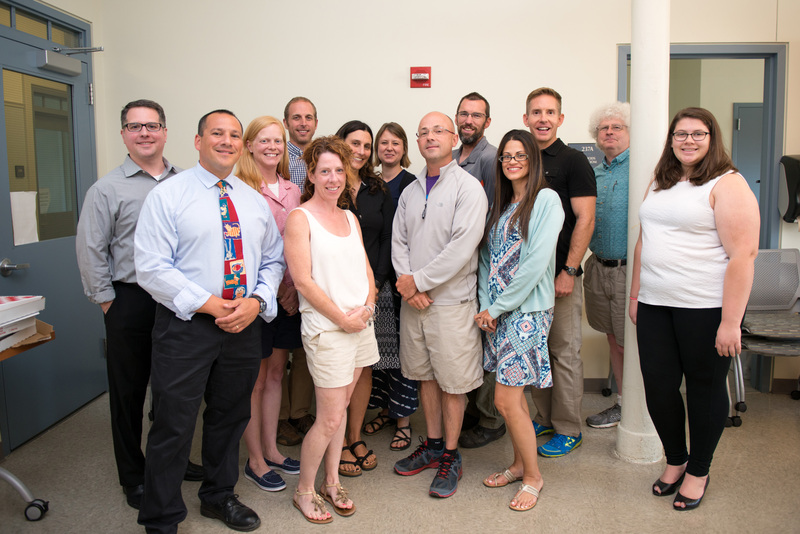 The inaugural Evolutionary Studies (EvoS) Summer Institute recently welcomed eight secondary education teachers to SUNY New Paltz for a week of intensive instruction in evolutionary topics ranging from human origins to art, health and human behavior. Designed to help teachers master the breadth of content needed to effectively teach evolution in a secondary education curriculum, the institute featured lectures, a hands-on laboratory experiment, screenings of recorded talks from the EvoS program’s annual lecture series and a nature hike in the Mohonk Preserve. Aileen Toback, a seventh-grade life science teacher from Heritage Middle School in Newburgh, N.Y. and a member of the New York State Master Teacher Program cohort administered at New Paltz, praised the program’s interdisciplinary format. Participating EvoS faculty members included Glenn Geher, EvoS director and professor of psychology; Aaron Isabelle, professor of childhood and early education; Kenneth Nystrom, associate professor of anthropology; Spencer Mass, lecturer of biology; Tom Nolen, associate professor of biology; Jeffrey Reinking, associate professor of biology; and Hamilton Stapell, associate professor of history. Completion of the Summer Institute qualifies participants to earn up to three 15-hour-based continuing education credits. Certificates of completion were presented at a ceremony attended by many of the EvoS instructors. Geher said he hopes the EvoS Summer Institute becomes grows into a staple of the summer professional development curricula offered at the College. Planning is already underway for next year’s installment, with expanded promotional efforts targeting a broader audience. The EvoS Summer Institute is sponsored by the College of Liberal Arts and Sciences, Honors Program, School of Education and the Mohonk Preserve. Support for the program was provided by EvoS assistants Nicole Wedberg and Meredith Siegel along with Helise Winters, dean of the Office of Extended Learning. Funded by the National Science Foundation, New Paltz’s Evolutionary Studies Program includes more than 10 Ph.D. faculty who teach dozens of evolution-related courses across the curriculum including anthropology, art history, biology, black studies, communication disorders, English, geology, history, physics and psychology. The cornerstone of the program is the Evolutionary Studies Seminar, which includes lectures by external speakers with expertise on various aspects of evolutionary scholarship.